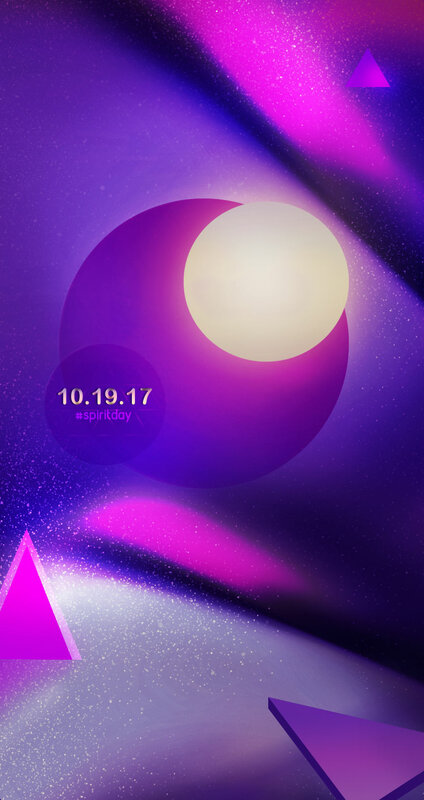 Learn how to design a purple iPhone wallpaper in honor of Spirit Day! For this tutorial, I’ll show you how to use gradient backgrounds, star brushes, and more to create an iPhone wallpaper design. My mind is just blown that I get access to so many lovely goodies on Envato Elements, so lately I’ve been sifting through all the background collections to find one to put my spin on. The size of your wallpaper will depend on your personal iPhone. I’ve got an iPhone 6, so we’ll just go with that. Let’s move on to the background! I’ll be using #16 for my wallpaper. The image is pretty big, so we’ll need to rotate it to show off my favorite area, the orange color. Let’s create a new background using these two gradient layers. Use the Free Transform Tool (Control-T) to help reposition this layer towards the bottom of the blue area. Select the Brush Tool (B), use a Soft Round Brush with 0% Hardness and 90-100% Opacity to paint black onto the white Layer Mask. Paint away the harsh edge from the picture and keep adjusting it until you’re happy. Let’s paint some texture using the Star Brush from this Photoshop Brush Pack. When you’re finished, use the Eraser Tool (E) to softly erase away some stars. Start with a medium to low Opacity and increase it when needed. Let’s continue tweaking the colors until we’re happy with the result. Here’s the result. Now it’s more in line with Spirit Day colors! Here’s a before and after comparison after applying Color Balance and a new color fill. For more depth, let’s establish the foreground, middle and background sections of this composition with more geometric objects. For a little more sultry atmosphere, we’re going to adjust the lighting of this scene. Let’s add the “sun” object for this piece. It wasn’t originally intentional, but it’ll later help to draw in the viewer. We’ll leave the final circle shape which holds the date for Spirit Day for the last steps. For the last steps of this iPhone wallpaper design, we’ll need to adjust the contrast and add a date! Let’s start with a New Adjustment Layer of Color Lookup. Here’s the result—it’s subtle, but well worth the effort. For a little movement, let’s create a 3D trianglular shape that floats into the scene. Create the text for the date and hashtag with two new text layers. I’ll be using this Reef Font and Arial Rounded MT Bold. Set the date to white and #spiritday to pink #ff28ff. That’s it! Check out the final result below. I hope you’ve enjoyed this tutorial. Feel free to leave comments, results, and any questions below!